Three months ago, I wrote about why I decided to travel to Taiwan this winter. After spending a total of 25 days in Taiwan (4 of those solo), circling the country clockwise from Taipei in the north to Kenting in the south, Taroko in the East to Tainan in the west, I feel like I’ve gotten a pretty good overview of that destination. There were many things I loved about Taiwan. But there were also things I didn’t enjoy at all. Below is a quick summary of my impressions. Taiwan is touted as a foodie paradise, and I have to admit that I never had a bad meal, despite the language issues. I got to try all the items on my list, plus a few specialties that I discovered along the way. Many menus had English translations and/or pictures. In night markets you could always watch and point, even if you couldn’t ask many questions. 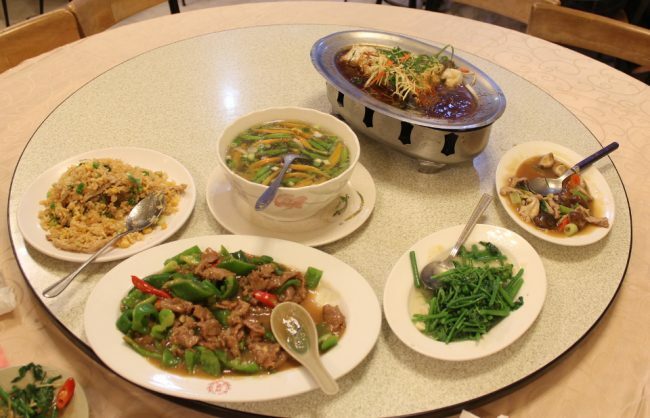 You’ll find not only Taiwanese food in Taiwan, but also food from various regions of mainland China. Among “ethnic foods”, Japanese is the most commonly found, followed by Korean, Thai, Indian, and even Italian. For more details, read my mini guide where and what to eat in Taiwan. Stand in a public spot looking confused, or consult a map for 30 seconds to a minute, and a Taiwanese person is likely to stop by and try to help. Even if their English skills are minimal, they’ll try to give you directions, and often go out of their way to walk you somewhere! The only other place where I’ve witnessed this before is Japan. While most locals don’t speak English, those who do may sometimes even approach you for a little chat. Independent tourists, especially non-Asian ones, are still a rarity in Taiwan, and I guess that makes us a curiosity. Despite this, people don’t stare at you, the way they do in many other Asian countries. Public transportation in Taiwan is great, much better than Canada. I’d say it’s on par with Japan and some Western European countries. Various trains connect the large cities, from the slower milk-run ones, to the high-speed trains (HSR) that can reach speeds of 300 kms/hr. 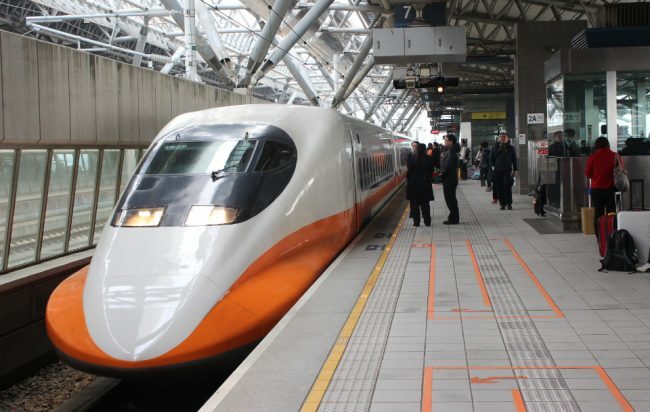 You can buy tickets for long-distance trains online. Where trains don’t go, buses do, usually from several different companies. All the trains and buses we took always left on time. Within Taiwan’s two largest cities, Taipei and Kaohsiung, a metro system (called MRT) lets you travel around town easily and efficiently in modern and clean cars. You can use the prepaid EasyCard on both systems, to simplify fare payment. 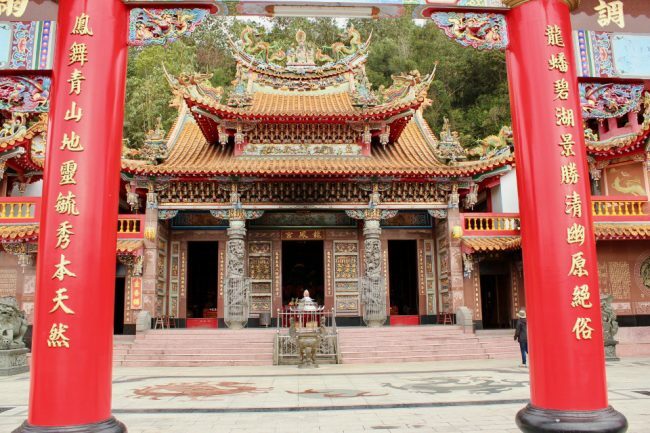 Taiwan is full of Taoist, Confucianist, and Buddhist temples, most of them a riot of colours and carvings. It is truly difficult to admire and photograph a Taiwanese temple as the eye doesn’t know where to look. Almost every surface is carved into intricate designs and painted in all colours of the rainbow: columns, walls, ceilings. Even the tile roofs are adorned with lace-like sculptures. Dragons and tigers are two popular motifs. Inside, statues of different gods, representing everything from medicine to agriculture get asked for favours with piles of food and flower offerings, and the burning of incense sticks (and sometime candles as well). It can be quite a scene around holidays with hundreds of people milling around. 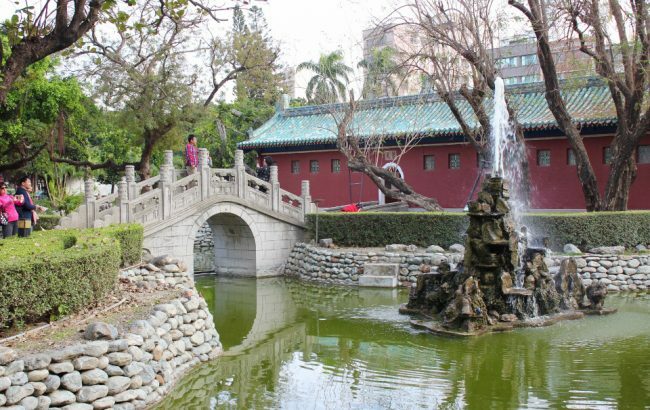 Gardens in Taiwan are peaceful places, often with ornamental bridges over small streams, gazebos, sculptures, and clusters of bamboo stalks. They’re not boisterous places like Mexican plazas, or spots to eat one’s lunch as in the West. Rather, they seem to provide people passing through (and perhaps stopping for a while) a moment of quiet contemplation away from the typical hubbub and traffic of Taiwanese cities. 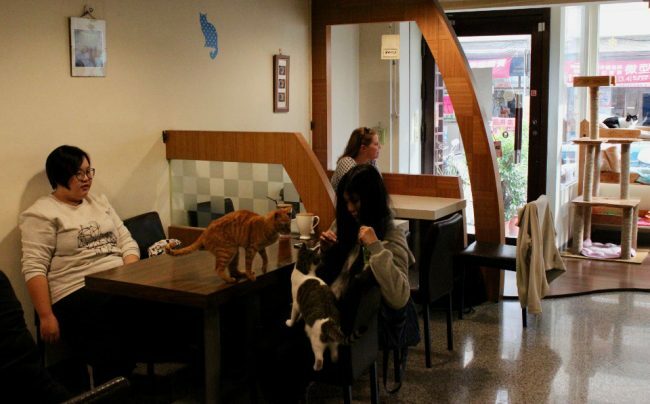 The first ever cat café opened in Taipei back in 1998, and that city now counts around 50 of them! Other Taiwanese cities have them as well. I love coffee and I love cats, so for me it made sense to visit one while in the country that started the trend. We checked out “Cats & Tea” in Tainan, which had about a dozen cats strutting around, dozing, playing with customers, or just peering at us from their perch. I had tea and scones (not cheap, but not too pricey either) and watched the cats’ antics for a good hour. One even came to see us as soon as we sat down. There were a few other customers, but everyone was very peaceful and respectful of the cats. A great experience. This may sound silly, but the 7-11 convenient stores became a reliable fall-back option in a country where we couldn’t always find what we wanted. 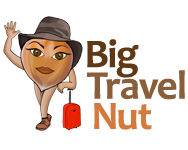 They provided decent lattes for US$1.20, a place to buy snacks, basic toiletries, emergency breakfasts, and ATM machines to withdraw money. They let us quickly add credit to our EasyCard, and some even provided clean public washrooms. For those who can read Chinese, a special machine also allows you to do things such as collect your train tickets after booking online. We never noticed Western-type grocery stores in Taiwan, but convenience stores were on every block. Besides 7-11, Family Mart and Hi-Life are two of the most common ones. 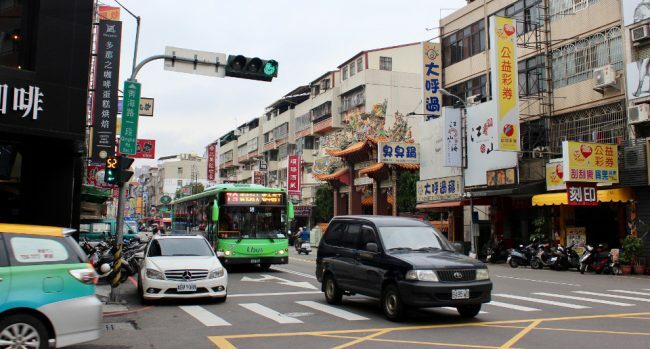 With the exception of Taipei, I didn’t find Taiwanese cities particularly pedestrian-friendly. Neither Kaohsiung, Taichung, nor Tainan has proper sidewalks, forcing pedestrians to either walk around parked cars in the street, or around parked scooters on the “walkways” in front of shops. These walkways are full of uneven steps and obstacles, making them a tripping hazard, especially at night. And talking of scooters, they’re everywhere, and at times they seem to think they’re pedestrians too. They ride and park near the entrance of shops. (The electric ones are especially sneaky as they come up behind you silently.) They make very tight right turns when the traffic lights change, nearly colliding with you as you try to cross. I had a few close calls. While we’re on the topic of traffic lights, I have to admit that I’ve never had to wait a minute and a half to cross a street at a light before! Most traffic lights in Taiwan have a 60+ seconds countdown which easily adds five minutes or more to even a short walk. Taipei, in contrast, has wide pedestrian-only sidewalks (even bike lanes) and fewer scooters than the other large cities. You can’t escape the long traffic lights here either unfortunately. Clearly, there are more things to love than hate about Taiwan. Just be prepared for the scooter onslaught in cities outside of Taipei, or spend most of your time in the countryside. Popular sites like Taroko Gorge and Sun Moon Lake are likely to be overrun by Chinese tour buses however, especially on weekends when the weather is nice. I used the Lonely Planet Taiwan guidebook during my 25-day trip around Taiwan and can recommend it. Never been to a cat cafe in Taiwan, but I agree with a lot of these. I also love the cultural centers that are often made from converted warehouses.